The Hilux (+43%) helps Toyota to its highest January volume in 10 years. Australia starts 2018 at a record pace: January sales are up 4.3% year-on-year to 88.551 units, a new record for the month eclipsing the previous best of 85.430 established in January 2013. SUV sales have now carved themselves up a solid advantage, up 10.9% to 37.859 vs. just 31.890 (-8.7%) for passenger cars. Note that a year ago in January 2017, SUVs still had never surpassed passenger cars. Light commercials soar 20.3% to 16.776. 4×4 utes (local slang for pickup trucks) are up 26.6%, small SUVs up 25.5% and medium SUVs up 19.2%. Private sales are down 3% to 45.482, business sales up 17.1% to 36.772, government sales up 2.2% to 2.609 and rental sales down 22.3% to 1.662. The leading sources of vehicles sold in Australia this month are Japan up 5.3% to 26.846, Thailand up 19.5% to 23.482, South Korea up 7.7% to 13.732, Germany up 6.3% to 7.187 and the U.S. down 15.9% to 3.141. The ranking by State is as follows: New South Wales (Sydney) down 0.2% to 28.995, Victoria (Melbourne) up 5.4% to 25.961, Queensland (Brisbane) up 9.8% to 17.246, Western Australia (Perth) up 5.2% to 7.401, South Australia (Adelaide) up 3.5% to 5.314, ACT (Canberra) up 8.5% to 1.561, Tasmania up 6.1% to 1.418 and Northern Territory up 0.4% to 655. 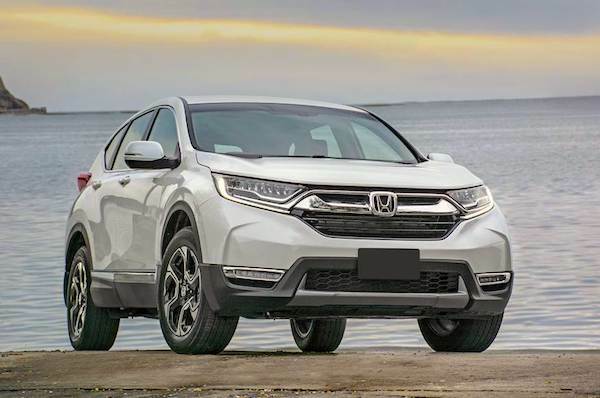 The CR-V is up 167% year-on-year, propelling Honda to its largest share this decade. 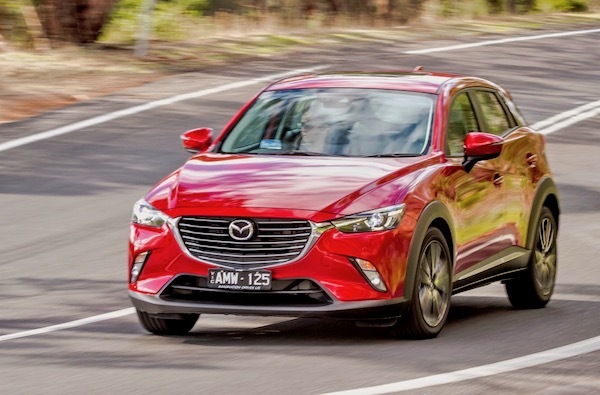 The CX-3 ranks at #10, helping Mazda to 11.4% market share. 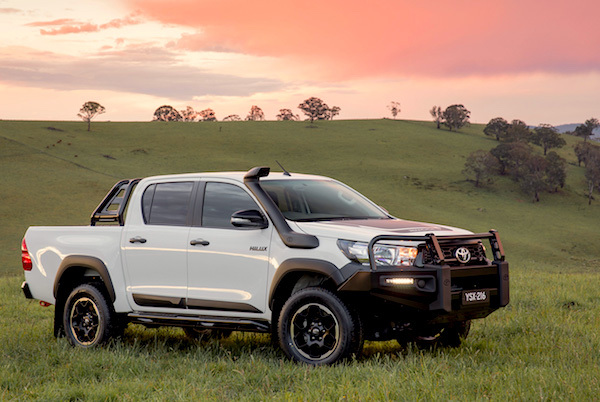 Model-wise, the Toyota Hilux is the best-selling vehicle in Australia in January for the first time, surging 43% to a new record volume for the month, just as it enters its 50th year in showrooms. Like in FY2017, the Hilux is followed by the Ford Ranger up 24% year-on-year, but the Ranger wins in the 4×4 ute segment, although by just 12 units at 2.892 vs. 2.880. #1 in the country every January since 2012 due to its strength with private buyers, the Mazda3 (-8%) drops to #3 this year ahead of the Toyota Corolla (-6%) while the Mazda CX-5 (+12%) reclaims the title of best-selling SUV in the country at #5 overall. The Toyota RAV4 (+28%) and Nissan X-Trail (-5%) follow at #7 and #8 respectively. 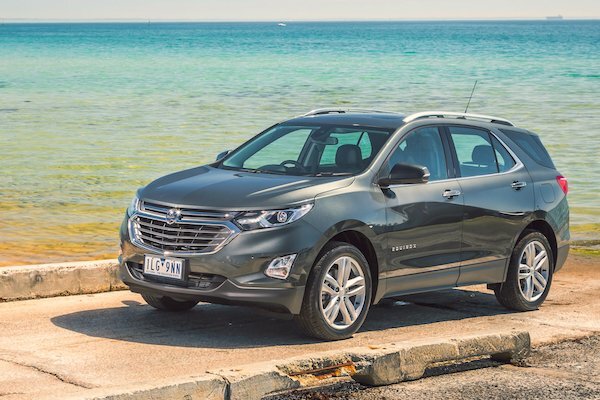 The Holden Equinox makes its first official appearance in the Australian sales charts. Below the VW Golf up a strong 25% to #9, the Mazda CX-3 (+6%) makes it three Mazdas in the Top 10 like in January 2017. The Nissan Navara is up 63% to #11, the Mitsubishi Triton up 33% to #11 and the Honda CR-V up a gigantic 167% to #13 thanks to the new generation. Further down, notice the Honda Civic (+48%), Subaru XV (+78%) and the Hyundai Kona up 10 spots on December to lead all recent launches (<12 months) by a large margin at a record 22nd place. The next best thing is the Toyota C-HR at #44 (+3 on December), followed by the Mitsubishi Eclipse Cross at #63 (+51). We welcome four new nameplates in the Australian charts this month: the Holden Equinox at #67, the Hyundai Ioniq at #170, the Jaguar E-Pace at #182 and the BMW X2 at #213. Full January 2018 Top 45 All-brands and Top 280 All-models below. Australia Full Year 2012: Now with exclusive rankings by State!